If you're looking to explore the city centre, Books Hostel is a great base. It's located in the cultural and historical surrounds of Lapa, near Centro, two metro lines and Santos Dumont Airport as well as some of the city's most popular bars and weekend street parties. Guests tell us the 'laidback but upbeat' staff create a quirky, relaxed, family-like atmosphere which is 'very good for partying and getting to know Sta Teresa and the city centre and not just the beaches - and if you want some beach, just rent their bikes and do a trip to Copacabana and Ipenema'. 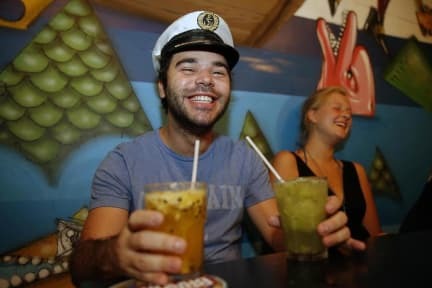 We like their cheap nightly caipirinhas. What a fun hostel! If you want really good social atmosphere this is the place to be at, the people I met here and the activities the hostel organized made my trip to Rio so memorable . The staff is super nice and makes you feel welcome, and the free breakfast every morning is fresh and delicious. Every night is a party you won't want to miss out on so be prepared to not sleep! Can't wait to stay here again on my next trip. A really great place to stay. Everyone was really friendly, the good vibes flowed well here. All you could ask for in facilties, the wifi was even decent. Love you PLUMEEEE my fave volunteer. 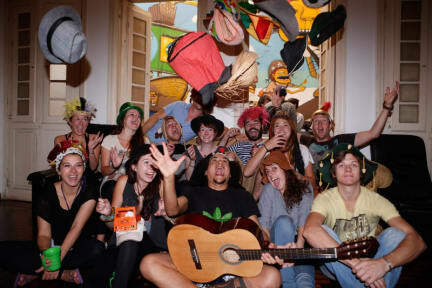 This is a very “casual” hostel, from the amenities to the way it operates. Can’t say it’s bad cuz it fulfills the purpose - simply to have a place to stay over night. Nevertheless it’s so noisy; the talking & music are loud, and it could last till early morning. It’s good for night awls guests who have a lots energy & don’t want to sleep, or very little sleep. I had here four nights and every night i fight with the workers in here, they make me feel like im worthless and most of the visiters here think it because i speak with them and we all think about it. Everyday there is vomit in the couch and the workers dont care about it, i had to clean someone one vormit. Threres is no hot water in the shower but if you want to play beet pong they play it everyday. A place you go if you want to blow your mind off. The nights are loud, the noise everywhere, the AC not working as you can’t close the window fully and facilities such as restrooms simply a mess. If you want to blow your mind out and don’t care about sleeping it might be a place to go; for me it was not. According to our guests, what makes us different is the hospitality, atmosphere, the art around the hostel, our great experience recommending people to look for programs very different from Lonely Planets and tours, and the price we charge for the service. We like to host people, and we've a very high standard with this. We want to be better and better and we're never satisfied with what we have. We're constantly seeking new investments and new arts and we're always smiling. I think everyone that works here loves what they do. From the housekeeping to me, the owner, we all know how important is to work happy in order to provide a relaxed and comfortable atmosphere to the guests. For fun, we allow people to bring alcohol and they basically drink, listen to music and talk. When guests go out they look for cheap places like jazz in the street on Wednesday nights and the Lapa Street Party.